Now, while it was true I had the ring to prove it, I didn’t understand the full meaning of that phrase until later. 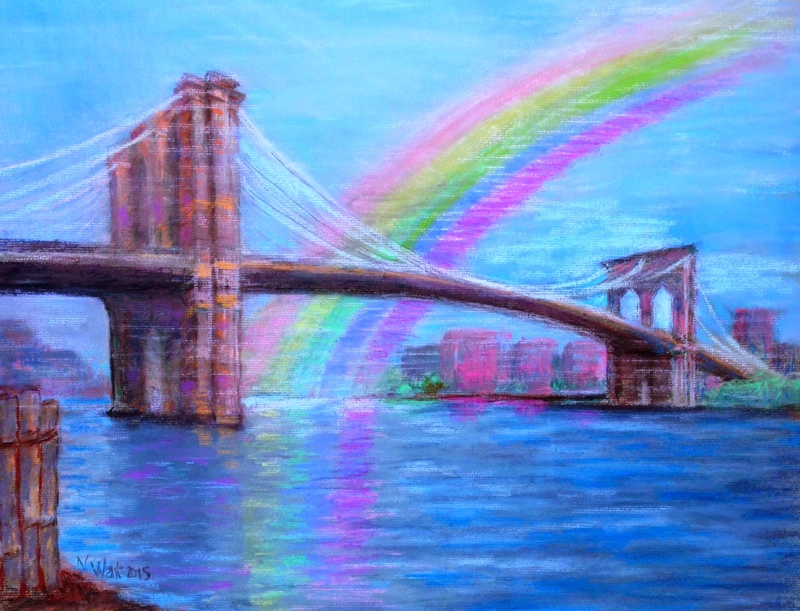 Not until today, actually, when I looked again at the pastel painting I did over the weekend of a rainbow intersecting the Brooklyn Bridge, its light shimmering on the water. The key here is water. Unless you become a deep-sea diver, and follow the (heavenly) (reflected) light into the (earthly) waters of dream and imagination… bringing those depths of feeling up to the surface, perhaps in a painting, perhaps in a story… But somehow giving it expression. Making it real. An “Over-the-Rainbow-Survivor” is an idealist who survived. A dreamer who never lapsed. Never became cynical. A person who could grow up to see her illusions crushed, stampeded into the ground and trod on, yet still found joy in a rainbow. An “Over-the-Rainbow-Survivor” is really someone who went under the surface, who followed the light reflected in the water… in order to one day rise to that level of light, (the inner light). Following it all the way, until it surfaced again, refreshed and cleansed, after she had come full circle. Originally, I moved from Manhattan to Brooklyn in 1982 when my marriage ended and I was resolved to paint my inner life. After four years I returned to Manhattan to complete the series of paintings I called “Journey to the Deep.” Then two years later, in 1988, I met my second husband, and we moved back to Brooklyn where I have remained ever since. The second marriage didn’t last either, but my union with Brooklyn did. And eventually, my union with the rainbow. It was this light which led me to join Rainbow Light Foundation. Located in the north of England, it is a ‘not for profit’, non-denominational organisation founded by Carol Lamb and dedicated to promoting greater understanding of the soul sciences; the links between body, mind and consciousness. I now administer the Rainbow Light Forum, and am currently enrolled in the Quantum Light Programme of the Academy of Spiritual Sciences. This entry was posted in ART, Art of the Path and tagged art and ascension, art and healing, Brooklyn Rainbow, inner light, inner v. outer reality, inner world, painting, Rainbow Light Forum, Rainbow Light Foundation, the nancy who drew. Bookmark the permalink. Beautiful journey. I have that ring! Great to hear! 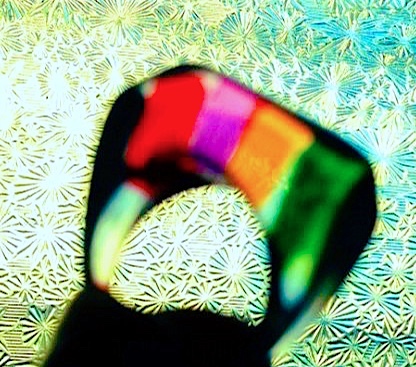 I’ve had my ring for about 20 years – and I treasure it.